The project stems from goals to build a community for female graffiti artists and to increase awareness of the additional challenges female graffiti artists face. Equal Parts is a website and community of artists and activists committed to actuating social change through public art activism. The project stems from goals to build a community for female graffiti artists and to increase awareness of the additional challenges female graffiti artists face. Designers Andrea Cameron, Gahee Kang, Cody Pfleging, Karen Vellensky, and Jenna Witzleben created the website through an intersectional feminist lens. 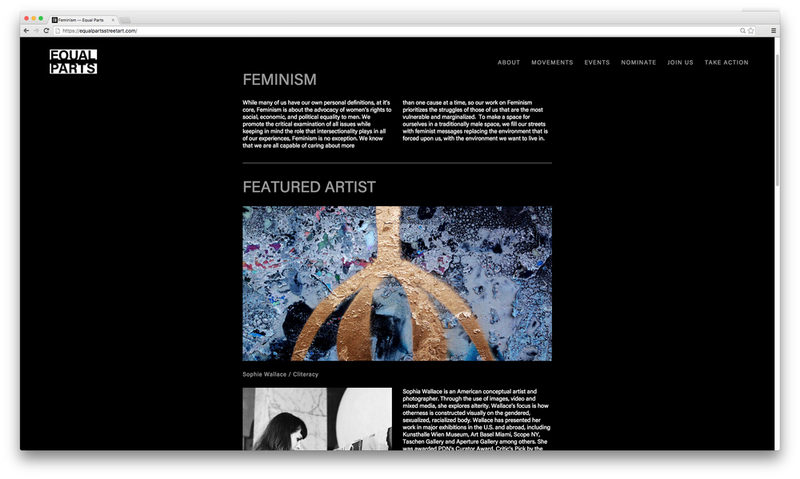 Thus, the website features artwork, information, and ways to take action in your own community, within the feminist movement as well as many other progressive social causes. Equal Parts embraces the interdependent nature and need for solidarity in all social justice efforts. The second part of the website is the call for action. Visitors are prompted to go to a page of downloadable content—including stickers, stencils, and posters that they can use in their own communities. Many artists are already using graffiti as a medium to share their messages broadly, so the team aimed to embrace this trend and amplify it on the website. Equal Parts has two main features: There is a page for each of several major social justice movements, including a featured artists and street art galleries. Here you can learn about the movement and what types of work are currently being created to support it. The second main part of the website is the call for action. Visitors are prompted to go to a page of downloadable content—including stickers, stencils, and posters that they can use in their own communities. This page functions to encourage more people to start using graffiti and street art as a tool for social change.